I am hosting a Gold Mine Contest on Monday Artday ATC group. The way it is played is that all the players that sign up make an ATC with that theme and mail it to me, and I post each ATC anonymously. Then after I have received and posted all the ATCs from the players of the contest then the players vote on their favorite one. The player of the ATC that gets the most votes wins all the ATCs including mine. I will not vote as I know who's ATCs they are. I will not post my ATC but it will be a gift for the winner. The theme is In The Kitchen. The players get to make an ATC with anything that has to do with the Kitchen. 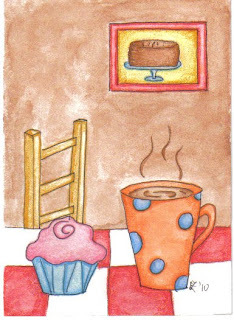 This is my ATC that will be included in the lot of ATCs that winner will receive.